SANTA CLARA, CA and SHENZHEN,CHINA, --(eSolarEnergyNews)-- Bolymedia Holdings Co. Ltd., a global high-tech company headquartered in Silicon Valley, is pleased to announce its latest technology for renewable energy at the Chinese Renewable Energy Conference November 3, 2016 in Wuxi, China. BolySolar is a complete set of solar system technologies that will revolutionize the energy industry. At CREC 2016, Boly will announce its third product of BolySolar Concentrators – BolySolar Roof. Not only does BolySolar Roof cost less than an average rooftop solar system, it also costs less than a regular roof. This technology does not need a sun tracking system like other concentrated solar power systems and can be adapted to roofs of any orientations. The system not only generates electricity at 40% or more efficiency, it also provides a heat source and can eliminate traditional heating methods in a house. The Heat Utilizer can be a hot water tank that not only provides hot water, but also can warm the house during the winter. A more advanced Heat Utilizer can serve as energy storage, allowing total energy freedom for many of the residential and commercial buildings. In addition to applications in residential and office buildings, the technology can also be applied to highways. "In contrast to other solar highway proposals, we recommend a Solar Shade solution using our technology," says Dr. Xiaoping Hu, CEO of Bolymedia Holdings Co. Ltd. "A Solar Shade is not only more economical than a solar highway, it is more durable, and 2-4x more energy efficient. 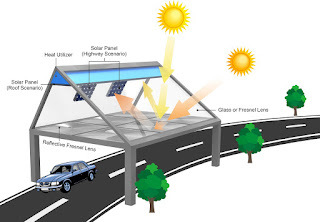 Also, for a highway going east-west bound, or when there is heavy snow, rain, or fog, a Solar Shade makes the highway much safer. Sun-glare, snow, rain, and fog are the some of the many causes of accidents. A Solar Shade is a solution to these problems, and the cost of a Solar Shade can be paid off in two to three years from electricity generation and reduced highway service needs. With smart sensors, a Solar Shade can change the driving experience."